I finished the trip by driving west across metropolitan Los Angeles toward the airport. Bypassing the Nixon Library/Birthplace/Burial Site in Yorba Linda (motto: "Privately Funded So No One Can Correct Our Lies"), I stopped at the oldest surviving McDonald's in Downey, which will celebrate its 50th anniversary three months from today. 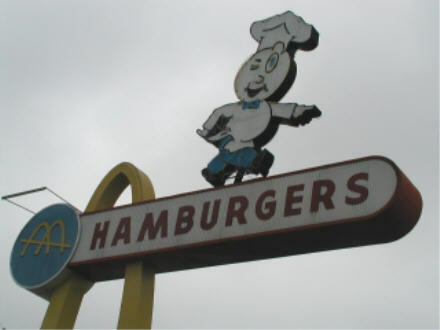 Its vintage sign proclaims, "We Have Sold Over 500 Million." 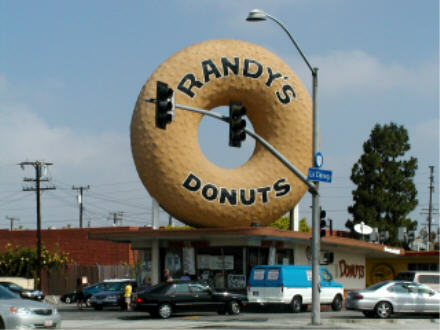 Several other roadside landmarks I had read about over the years had fallen victim to the developer's bulldozer, but Randy's Donuts in Inglewood, just a mile or two from the Los Angeles Airport, still looks just as it did decades ago. Reached the airport an hour and a half before my scheduled departure, then spent nearly 1/3 of that time standing in line at a security checkpoint, two places behind someone who all too evidently hadn't showered in days. What's worse, he seemed the gregarious sort. I had visions of being stuck in the seat next to him all the way to New York, but thankfully he was headed in another direction. When the waterfalls are flowing and the road to Glacier Point is open, Yosemite is the best one-day outing in America. It's a little depressing to realize that there are several radio stations in any major city that don't call themselves oldies stations, yet whose entire playlist for any given hour could have been broadcast the day I graduated from high school. Among newer artists in any radio-friendly genre, the White Stripes are the only ones impossible to confuse with anyone else. More states should follow California's example of posting user-friendly signs to guide visitors from major freeways to historic landmarks. Final totals for this trip: 196 photos taken, many of which will end up on my Web site; five major parks visited (Death Valley, Sequoia, Kings Canyon, Yosemite and Pacific Bell); two Pizza Feeds; two get-togethers with college friends; and 3,395.7 miles driven.